The Sugar Plum Fairy bade Marie and Nutcracker sit down while a feast was brought before them: teas, cakes and the rarest of fruits. The food was the feast, first for the eyes, then for the palate… Marie hardly had time to nibble at her sweetmeats before the next diversion was presented: the music abruptly changed to an adagio tempo. Arabian dancers dressed in gauzy veils garnished with gold medallions and jewels swayed hypnotically past… The rich aroma of coffee drifted past. –from E.T.A Hoffman’s The Nutcracker and the Mouse King. The last days of each year are invariably orange hued for me: an evening spent peeling the stubborn orange peel with orange stained fingers and tossing the curls into the fire; the delicious icy chill of mandarins brought home from an outdoor winter market; the vanilla-orange sweetness of vin d’orange and slender orangettes dipped in chocolate. As I set the ingredients to make candied orange peel, I am once again a little girl watching her grandmother making this confection. To prevent me getting near the boiling sugar syrup, I would be given a large illustrated volume of E.T.A Hoffman’s The Nutcracker and the Mouse King. 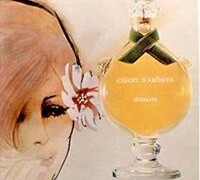 To this day, the scent of oranges conjures visions of fairy kingdoms, groves made of candied fruit and coffee scented dancers. Even though I make candied oranges often, the process of transforming fresh fruit into a crystalline morsel has not lost its magic for me. As the peel softens, absorbs sugar and becomes more and more jewel-like, its scent likewise deepens. Smell the oranges when you peel them—the perfume is floral and bright, with a bitter, metallic-waxy note. As the peels are blanched, the bitter notes vanish, while the orange blossom accent becomes more pronounced. The fragrance is no longer bright, but rather flat. Yet, as the peels are cooked in sugar, their aroma is once again revived. At the end of the preparation, the transparent, golden strips smell of honey, caramel and orange liqueur. There are numerous recipes for making candied citrus peel, and the method is fairly straightforward—first, the peel is either soaked in water for several days or boiled to remove bitterness; then it is cooked in sugar syrup till transparent. My grandmother favored the soaking method over the course of several days, but I find that it tends to accentuate the waxy, metallic facets of orange perfume. Moreover, most commercial orange varieties today are not nearly so bitter as to necessitate a long soaking. My favorite recipe takes only two hours of work and an overnight maceration in syrup, which results in fragrant, fresh tasting peel. The below recipe comes from the renowned French pastry chef Pierre Hermé. It was published in almost all of his books, including Le Larousse des Desserts. 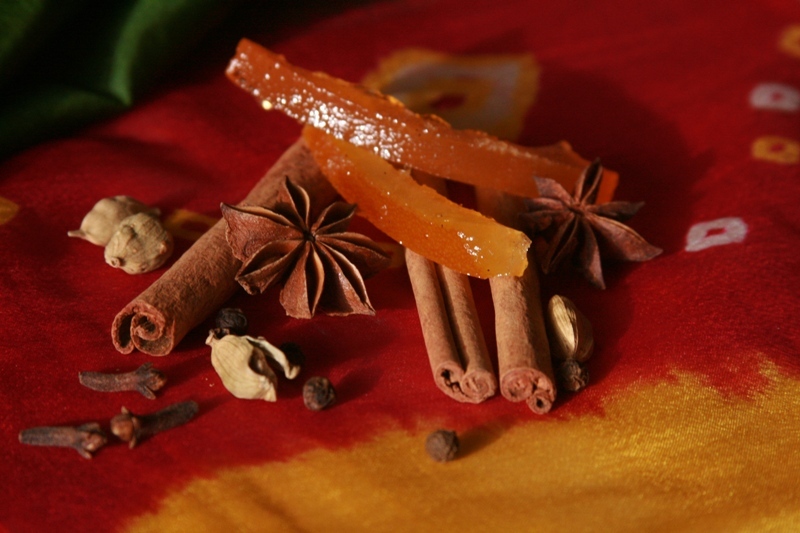 The vanilla and spices lend a brilliant twist to the citrus aroma, and as long as you do not add more spices than the recipe requires, they will not overwhelm the delicate floral caramel perfume of candied fruit. Another successful variation I discovered is to use 1/8 teaspoon saffron and ¼ teaspoon ground cardamom. Orange peel can be used in baking or on their own as a candy. One of my favorite ways to eat candied oranges is to slice them in tiny cubes and scatter them over my morning yogurt. I cannot imagine a better or more fragrant start to my day. 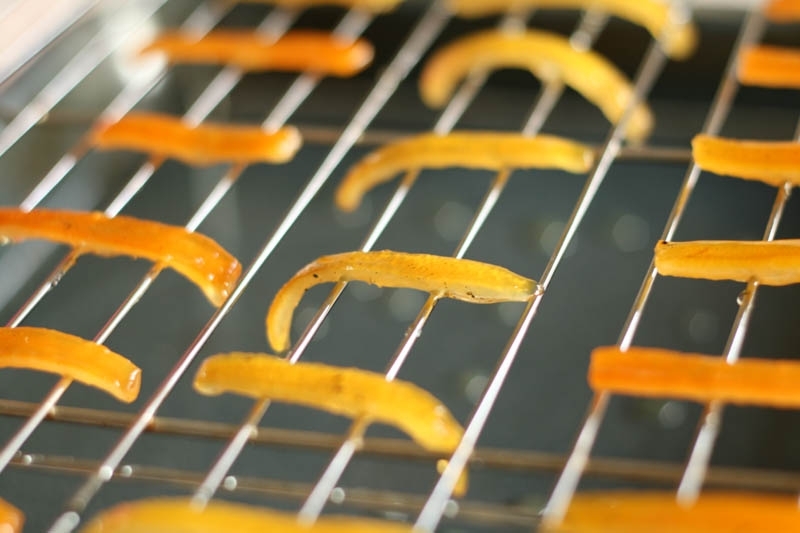 If you want to make orangettes, slice the peel in slender strips and once they are dry, dip them in melted chocolate. Thickly slice off the peel from the fruit. It can be left in large pieces or cut into thin strips. Cover with water and bring to boil. Simmer for 3 minutes, drain and rinse under running water for 2 minutes. Repeat two more times. This process softens the peel and removes bitterness. I do not mind a hint of bitterness, but especially if you are using grapefruit peel, taste it after the third rinsing and decide if you want to repeat the boiling. Drain the peel well and absorb excess water with paper towels. In the meantime, mix the ingredients for the syrup, except for the spices. Bring to boil, skim and let the sugar dissolve completely. Add spices and peels. The syrup should cover the peels completely, and it is best to err on the side of having too much, rather than too little. Cover the pot and leave it to simmer on low flame for 1.5 hours. At the end of 1.5 hours, the peels will be transparent and the syrup thick. Turn off the fire and leave the pot at room temperature for 12-24hours. Next day, remove the peel from the syrup and drain on a rack. Once the peels are dry, even if somewhat sticky, they can be tossed in fine sugar and stored in an air tight container. I usually skip the sugaring and simply layer them between sheets of wax paper. Best stored in the fridge. The syrup used to poach the peel is fragrant and delicious. It usually gels nicely and can be used as jam on toast or over ice cream. Try diluting it with sparkling water for a delicious lemonade. It also makes a fantastic glaze for lamb or chicken: mix 1 tablespoon of syrup with olive oil and crushed garlic and brush over the meat towards the end of grilling. I often do candied kumquats and feel very inspired by your spicy syrup! May I suggest an additional use for the syrup? Pour some on a really fresh and good ricotta cheese. You can arrange individual portions in tiny transparent glasses – the end result looks great and tastes delicious (and is rather low calory, too)! Musette: Pierre Herme’ is a god among pastry chefs – I adore his chocolate sables. I, too, love the poached syrup, probably more than the peel itself. It’s great in tea! Suzanna: I often make the candied peel for my mother, who adores it. I also make an orange butter that is wonderful on breads and muffins. Victoria: Tanya, I love the picture of brussel sprouts in your recent post! Cool lighting and depth of focus. Victoria: I love how the syrup sets into a luscious, transparent jelly. I finish it even before I eat the peel itself. behemot: Wonderful recipe, thank you! The syrup Iwe made at home did not have so many spices, so I will be glad to try yours, which is more complex. Victoria: Yes, 2 and 1/4 cups! If you use a real vanilla bean, the transparent jelly with the tiny black vanilla seeds is especially gorgeous. Victoria: Me too, I’ve always been a big fan. Victoria: Mmmm, wonderful! I will definitely try it. I like the idea of chocolate chips. Victoria: My grandmother also did not use any spices, other than a dash of vanilla. However, this is a very successful recipe. Herme is a genius when it comes to flavor.